This batch of amulets was chanted by the highest number of monks ever chanted for Luang Poo Thuat's amulets in Thailand. It was chanted twice in BE2506, once in 5th to 9th Mar BE2506 by 234 monks and the second time 14th-15th November BE2506 by 180 monks. The amulets were created by Phra Kroo Samut Umpon, the abbot of Wat Prasaht at that time in BE2506. Phra Ah Jahn Tim Wat Chiang Hai helped Phra Kroo Samut Umpon to create this batch of amulets using Wat Chiang Hai Luang Poo Thuat BE2505 Lang Dtow Reap's mould of the 3 different sizes; Pim Yai, Pim Glahng and Pim Lek. A total of more than 100,000 amulets consisting of Pim Yai, Pim Glahng and Pim Lek of different materials were created and chanted. However, 84,000 pieces of the amulets were stored inside the temple's chedi (pagoda) and the rest of the remaining were opened to the public to "chow" at 1 baht a piece. There were many materials used for the creation of this batch of amulets mainly because the monks who came for the chanting, had brought along some of their own materials to mix with the rest of the materials. Therefore one could see many different colours of the amulets although it origined from the same mould. 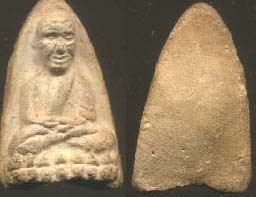 The more popular Pim from this batch of amulet is Pim Yai Neua Khaow (White Material) as they contained the most Bangkoonprom material from broken somdej(by Somdej Ah Jahn Dtoh). But it is hard to find and usually not in good condition. The price is around 10,000 to 20,000 bahts.